Russell Southwick receives the Worcestershire Cricket League Player of the Year award from John Barclay. 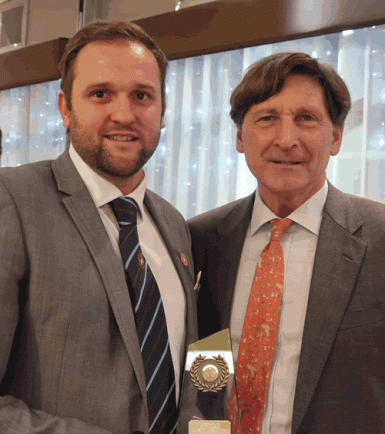 REDDITCH Entaco captain Russell Southwick was rewarded for a fine campaign when he scooped the Worcestershire Cricket League Player of the Year award. Southwick led the Kingfishers to a second successive promotion as their Worcestershire League Division One title triumph clinched a place in the Birmingham League for 2018. Southwick, who was presented with his prestigious accolade by former Sussex captain and guest speaker John Barclay at the Stourport awards dinner, scored 832 runs at an average of 46.22, including two centuries and five fifties.